BsnTech Networks was contacted by Rich, the owner of Light Pros, several weeks ago. Rich has chosen BsnTech to provide maintenance and update services to his eCommerce store. In addition, he has also had us take care of his marketing and newsletter requirements going forward as well. During the past several weeks, many updates were made to Rich’s website. Dozens of products have been added and removed from the website. Special promotions have been ran, changes to images and his slideshow have been completed, in addition to a re-working of his categories to make it easier for his customers to find what they are looking for. In the past three weeks, he has also had us manage his marketing e-mails and send out e-mails to over 11,000 subscribers on his mailing lists. He has us create and send out one e-mail each week with special deals and promotions. We appreciate the business that Rich has given us over the past several weeks and look forward to a long-term relationship managing his website! 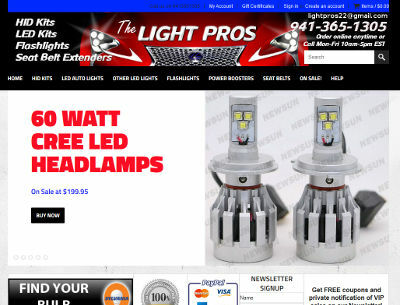 The Light Pros website is at light-pros.com.